Horner's syndrome or Horner syndrome is a clinical syndrome caused by damage to the sympathetic nervous system. It is also known by the names Bernard-Horner syndrome or Claude Bernard-Horner syndrome or as oculosympathetic palsy. Signs found in all patients on affected side of face include ptosis (drooping upper eyelid from loss of sympathetic innervation to the Müller or superior tarsal muscle, upside-down ptosis (slight elevation of the lower lid), and miosis (constricted pupil) and dilation lag. Enophthalmos (the impression that the eye is sunk in) and anhydrosis (decreased sweating) on the affected side of the face, loss of ciliospinal reflex and blood shot conjunctiva might occur depending on the site of lesion. Also flushing of the face is common on the affected side of the face due to dilation of blood vessels under the skin. 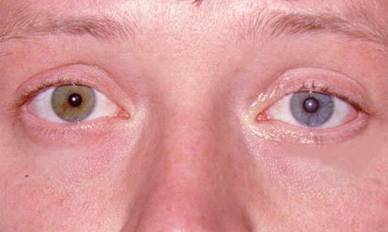 In children Horner syndrome frequently leads to a difference in eye color between the two eyes (heterochromia). This happens because a lack of sympathetic stimulation in childhood interferes with melanin pigmentation of the melanocytes in the superficial stroma of the iris. First-order neuron disorder: Central lesions that involve the hypothalamospinal pathway (e.g. transection of the cervical spinal cord). Third-order neuron disorder: Postganglionic lesions at the level of the internal carotid artery (e.g. a tumor in the cavernous sinus).